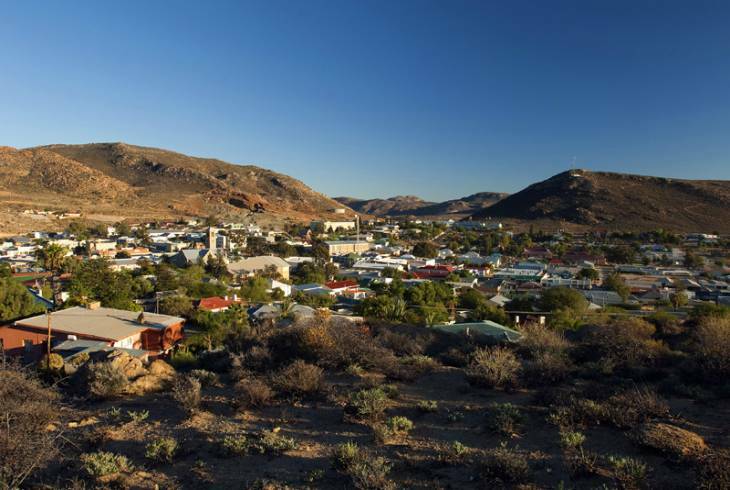 The small town of Springbok in the Northern Cape Province is situated at the junction of two major highways, the N7, main arterial road between Cape Town and Namibia, and the N14 to Johannesburg. The town was once called Springbokfontein because of the vast herds of Springbok that used to gather at a spring in the area. This was once a copper boom area, and the visitor can see the original prospecting shaft sunk by Cape Governor Simon van der Stel in 1685! Springbok is a friendly town with excellent amenities. Springbok is often referred to as the Capital of Namaqualand, and is located in the Koperberge. It is a picturesque little town surrounded by high granite domes. It is a wonderful stepping off point for visitors wishing to view the flowers of Namaqualand. Just to the east of Springbok is the Goegap Nature Reserve. This is a flora reserve of 15000 hectares and over 580 species of flora have been recorded here. 94 species of bird have also been seen here including the Cape Eagle Owl, the Black Eagle, the Spotted Dikkop and the Pied Barbet. Springbok overview. Springbok Accommodation and Information.